"When the angle of your dangle matters!" When you're looking for the top names in theater or theater supplies — how ever you like to spell it, including theatrical rigging hardware and equipment — StageSpot.com is the spot for you. We carry a wide variety of clamps, hoists, motors, hardware and trusses. 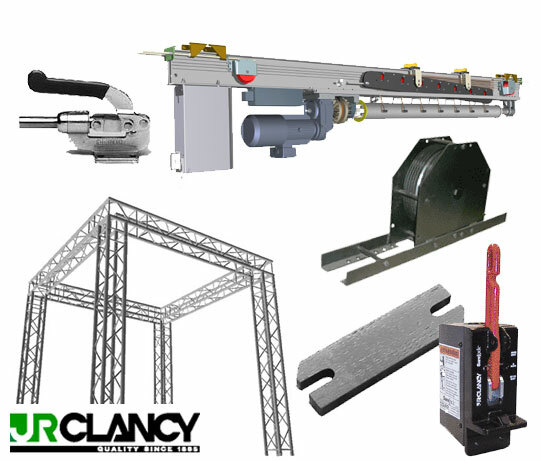 From JR Clancy to CM Lodestar, Global Truss to Thomas Engineering and ProBurger, we stock the top-of-the-line rigging equipment and hardware you need. We can get you anything from shackle pins to motorized line sets. You tell us the scope of your needs and we'll get what you need. StageSpot.com has the experience and contacts you can count on to ensure the theatre supplies and rigging equipment you order are the best for the job. Add to that our superior customer service and you've got a truly winning combination. We continually upgrade our product list and seek new ways to help our customers. We're currently working closely with JR Clancy, to ensure prime access to all the products they offer. We've also developed close relationships with ProBurger, ProSpan and other Pro-line rigging accessories manufacturers. If you need help determining what will work best for you (or you don't see what you're looking for), please don't hesitate to call us. We'd be delighted to help with your next rigging project.